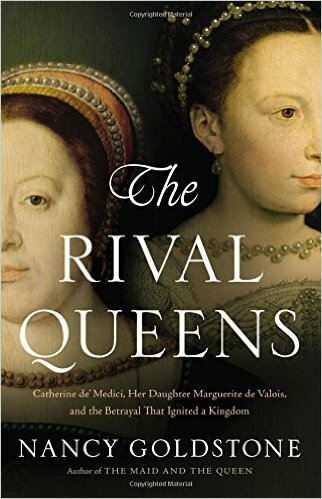 In her newest book, The Rival Queens: Catherine de’Medici, Her Daughter Margeurite de Valois, and the Betrayal that Ignited a Kingdom, Nancy Goldstone investigates the political and religious turmoil of sixteenth-century France and the tense mother-daughter relationship at the centre of both. As with her other books, readers of The Rival Queens get a close look at the role of women largely forgotten by history and yet a pivotal part of it. I got in touch with Nancy to ask her about her book, women in history, and the family whose idea of a great wedding is straight out of Game of Thrones. DC: What drew you to the Valois court, and especially Marguerite, in the first place? NG: I am fascinated by the lives of powerful women who have been overlooked by historians. In the Medieval and Renaissance periods, this meant focusing on queens, as they typically exercised more authority than other aristocratic women (although there were of course exceptions). Queens were also the most likely to be involved in, and possibly influence, key European events like wars, or major shifts in the balance of power or diplomacy. I had already researched and written books about several remarkable queens of the 13th, 14th, and 15th centuries, and was curious about the 16th. Obviously, Elizabeth I was a dominant figure who did not require investigating—there are certainly no shortage of works devoted to her reign! But because Elizabeth is so well known, she tends to overshadow the other important women in the period. What about the Valois court in France, I thought? After all, the St. Bartholomew’s Day Massacre is one of the central episodes of the century, right up there with the battle at Lepanto and the Spanish armada. And what did I—or anyone—really know about Marguerite de Valois, other than that she was the title character of Alexandre Dumas’s much beloved classic novel, La Reine Margot? So I started to research her life and understood instantly that she was nothing at all like the woman portrayed in the Dumas novel or by historians, who generally mention only that she was the bride in the wedding that kicked off the massacre, and rarely refer to her again. In fact, Marguerite was highly intelligent, the best educated member of her family (which is important because it is her mother who always gets the credit for being well read), and a potent political force in her own right. In other words, exactly the kind of woman I like to write about. DC: There are certainly a lot of intrigues and antagonists in the French royal family (to say the least!). What made you decide to centralize Marguerite’s relationship with Catherine de Medici instead of, say, her relationship with Henri III (her brother)? NG: It became apparent early on that there was no way to explain Marguerite’s life or character (or the deliciously corrupt Valois court) without talking about her mother. Catherine’s was the dominant ethos in France for over a quarter century. Also, there have been other books on Catherine de’ Medici, but none that focus on her relationship with her youngest daughter. That’s because the authors of those books simply accepted the prevailing historical opinion that Marguerite was a marginal figure at court, a sort of a sixteenth-century good-time party girl who put her own sexual needs ahead of her responsibilities to the kingdom. I obviously disagree. But more to the point, there was the St. Bartholomew’s Day Massacre to address. A wedding that went that spectacularly bad—that was a mother-daughter relationship worth poking into, I thought. DC: You begin each chapter with a quote from Machiavelli’s The Prince. Why did you want to draw this connection between Machiavelli and your two queens? NG: It is a commonplace that Catherine de’ Medici was a disciple of Machiavelli, and that she cunningly played off the various factions at court—Catholic and Huguenot—according to the sinister blueprint provided in The Prince. But although I’m sure she was familiar with the book, she seems not to have grasped what she was reading very well. If you look at the quotes I include at the beginning of each chapter, you will see that in almost every case she does exactly the opposite of what Machiavelli recommends! I would go so far as to say that it is Machiavelli who is maligned by having Catherine associated with his philosophy, rather than the other way around. I did not find Catherine to be particularly intelligent in her handling of the court, or the kingdom at large. She was simply expedient, and frequently made promises and negotiated treaties that she had no intention of keeping, and after awhile her subjects knew that her word could not be trusted and this worked against her. DC: Is there one character or story you came across in your research that you would have liked to explore more in depth? NG: I would definitely have liked to be able to discuss the later stages of Henry IV’s career—what he did after he divorced Marguerite and became king of France—as it was during this period that he developed into one of history’s great monarchs. But it was already getting to be a long book and there just wasn’t time for that. I would also have loved to go more deeply into the lives of Marguerite’s two sisters, Elizabeth, who married Philip II, king of Spain (poor girl), and Claude, who married the duke of Lorraine. Again, it was a matter of having so much material to get through just on Marguerite and Catherine that there wasn’t space left to pursue tangential characters, however fascinating. DC: You seem to be drawn to important women whom history has in large part forgotten or vilified (Yolande of Aragon, Joanna of Naples, Marguerite de Valois). What is it about them that you find so compelling? NG: When I was growing up, if I wanted to read about a woman who had actually accomplished something, I had exactly three choices: Florence Nightingale, Clara Barton, and Helen Keller. Even when I studied history in college, the only time I can ever remember that women were mentioned was during my American colonial period class. The women were of course the Salem witches, and as most of them were hanged, they could hardly be considered powerful female role models. It wasn’t until I was older, and writing European history, that I stumbled across a mention in the chronicle of Matthew Paris, a 13th century Benedictine monk, of the four daughters of the count of Provence who all became queens—queen of France, queen of England, queen of Germany (queen of the Romans), and queen of Sicily. Even from the little I was able to glean from the chronicle I could see that these women, who I had never heard of, exercised real power. Instantly curious, I went to find a book about them. Of course there was nothing and it was then that I realized that if I wanted to read a book about these sisters, I was going to have to write it myself. So I did, and discovered that it was impossible to really understand what was going on in 13th century Western Europe without this family. That taught me a big lesson: history makes a lot more sense when you put the women back in. So that’s what I’ve been doing ever since. DC: I couldn’t agree more! So, what are you working on next? NG: I’m writing a book about an unbelievably courageous woman, Elizabeth Stuart (granddaughter of Mary, queen of Scots), and her four daughters, Elizabeth, Louise Hollandine, Henrietta Maria, and Sophia. Elizabeth Stuart, known as the Winter Queen, has been credited with starting the Thirty Years’ War when she and her husband, Frederick, accepted the crown of Bohemia. Hers is an epic tale—danger, romance, adventure, intrigue, tragedy, sometimes when I’m doing the research I am so caught up in the documents that I barely breathe—and her daughters are even better. The eldest, Elizabeth, was an internationally recognized scholar and Descartes’s muse; the second daughter, Louise Hollandine, was an accomplished painter (and this is during the time of the golden age of the Dutch, one of the great periods in art history), the third sister, Henrietta Maria, married the prince of Transylvania; and the youngest, Sophia, a gifted writer who employed Leibniz as her personal secretary, inherited England. The members of the current royal family, up to and including Prince William and Kate Middleton’s adorable children, are all descended in an unbroken line directly from Sophia. As a family saga, it’s sort of a combination Gone With the Wind and Pride and Prejudice—Sophia wrote her memoirs and, hilariously, she sounds just like Jane Austen—and I feel absolutely privileged having the opportunity to tell it! DC: And we’re excited to read it! My thanks to Nancy Goldstone for speaking with us about The Rival Queens. For more from Nancy Goldstone, check out Four Queens: The Provençal Sisters Who Ruled Europe; The Maid and the Queen: The Secret History of Joan of Arc; and The Lady Queen: The Notorious Reign of Joanna I, Queen of Naples, Jerusalem, and Sicily.